As most fried rice recipes go, you begin by stir-frying a little bit of onion, garlic, ginger, carrot, and celery in some screaming hot peanut oil. From there the veggies come out, and the pineapple and sausage go in to caramelize a bit in the oil. The pineapple and sausage come out, and the rice goes in to fry and crisp up. Everything along with the baby shrimp goes back in to the hot skillet, and a sauce of tamari, pineapple juice, oyster sauce, sesame oil, and rice vinegar is poured over, it’s tossed a few times, sprinkled with green onion and it’s ready to be served. 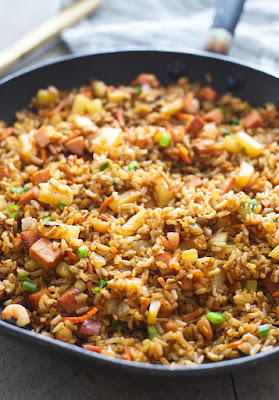 0 Response to "COPYCAT KONA GRILL FRIED RICE (AKA THE BEST FRIED RICE)"